Iris, a poem by William Carlos Williams, is a celebration of our senses. Williams' opening line a burst of iris stimulates a search for the sweetest odor that, in turn, reveals a blue as of the sea. Williams closes his poem with trumpeting petals, a word implying shape and sound. "the lightning conductor for my illness"
Van Gogh felt by continuing to paint that he could avert succumbing to insanity. It strikes the eye from afar. 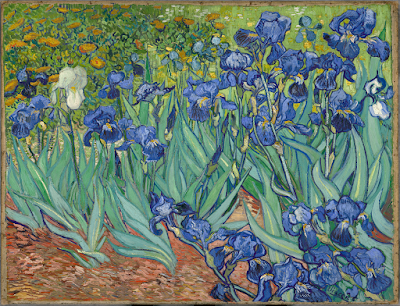 The Irises are a beautiful study full of air and life. Irises are perennials that shoot upward from creeping rhizomes. A rhizome is a subterranean stem that sends out roots perpendicular to the force of gravity while also sending up vertical shoots to greet the sunlight of Spring. With carefully chosen words William Carlos Williams devoted attention to the obvious and the overlooked. Williams, like impressionist Vincent van Gogh, devoted time to experiencing the subtleties of the senses. The natural world is indifferent to our inattentiveness, but also rewards the slightest attention with the sublimest of experiences. Georgia O'Keeffe, by Georgia O'Keeffe. William Carlos Williams, by William Carlos Williams, Christopher John MacGowan, Robert Crockett.